Even using your smartphone’s GPS, the layout of Japanese cities can be confusing when you’re down on the ground. Rather than a neat pattern of right-angled city blocks, streets seem to crisscross and veer off randomly, leading the purposeful pedestrian in different head-spinning directions. In Tokyo, Osaka and elsewhere, it’s easy to get caught up in the rat race of riding the train and subway without even realizing how the different station districts connect. With the rare exception of places like Sapporo, most cities in Japan eschew the typical grid plan of Western cities. One way to get a good lay of the land when you’re visiting a big Japanese city is by availing yourself of an elevated view somewhere — presuming you don’t have a fear of heights. The view from the lookdown window in Tokyo Tower. In this list, we’ll take a look at seven cities across the country and provide an overview of the best options for a bird’s-eye view in each place. 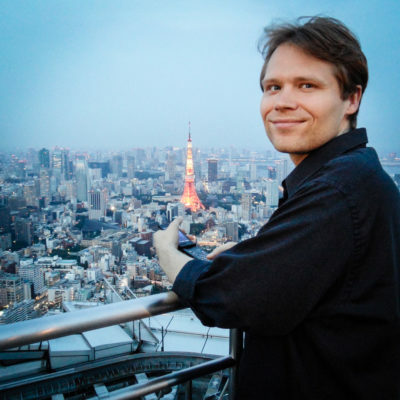 Observation decks (tenbo-dai in Japanese) are on the menu, but we’ll also be scouting some lesser-known options beyond the usual suspects like Tokyo Tower. This includes free observation decks and less obvious lookout points, such as the occasional… public restroom? 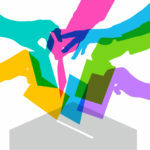 The name of this website — GaijinPot — invokes a melting pot of gaijin (foreigners). But it’s time now to embrace your inner “skyjin” or resident of the clouds. 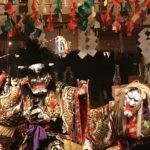 Don your aviator sunglasses and get ready to fly north to south across the Japanese archipelago as we embark on an aerial, city-by-city tour of Sapporo, Tokyo, Yokohama, Kyoto, Osaka, Kobe and Nagasaki. 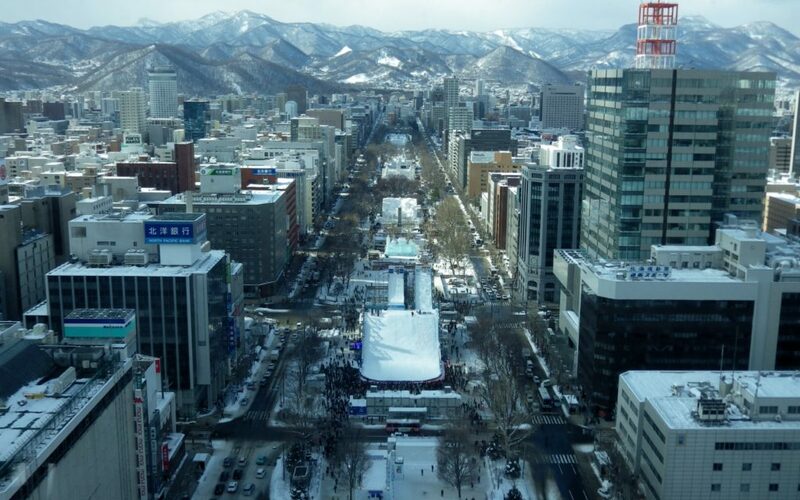 View of Odori Park from Sapporo TV Tower during the snow festival. 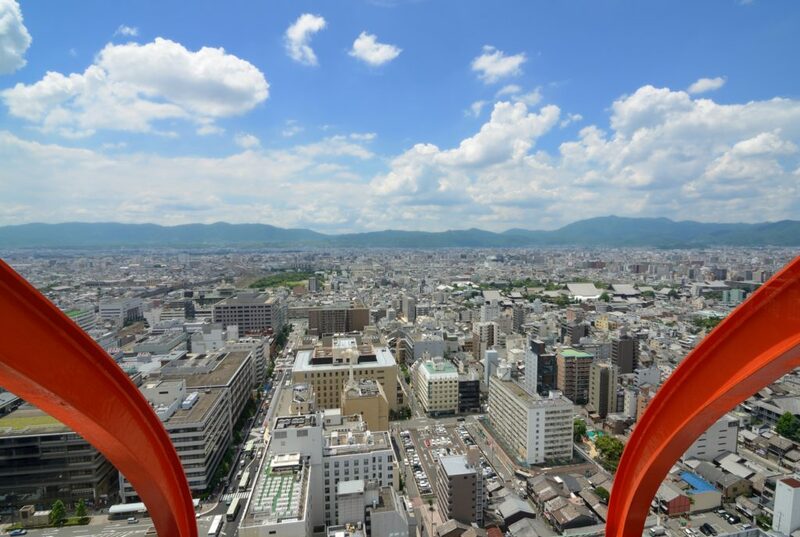 Almost a straight shot, visually, from Sapporo TV Tower — beyond the 1½ -kilometer stretch of Odori Park — is Mt. Okura. On the mountain’s eastern slope, the Okurayama Ski Jump Stadium has its own observatory, which is accessible via a chair lift (¥500 for a round-trip). The Okurayama Ski Jump Stadium is a bit out of the way — you’ll need to take a bus or taxi to get there — but this place is a piece of Olympic history. It hosted the large-hill ski jump competition during the 1972 Winter Games. 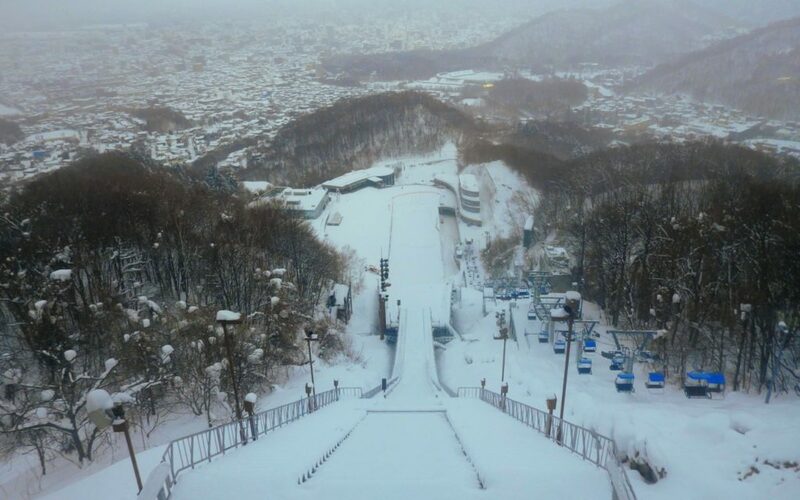 While you’re there, you can commune with the spirit of ’72 and imagine yourself as an Olympic athlete looking down on Sapporo. Looking down on the dizzying Okurayama Ski Jump on a wintry day..
For a quieter alternative to Sapporo TV Tower — and a nice exterior view of it — try hitting up JR Tower Observation Deck T38 (¥720 admission). A great many people pass by this observation deck on their way out of Sapporo station. It’s located at the top of the 38-story JR Tower, hence its name. When I was there, there were fewer visitors than the bustling TV tower. I was immediately hit by an atmosphere of serene stillness as I approached the spotless windows to see the snow-covered city. The view from JR Tower mirrors the establishing shots you’ll see after the opening title sequence in Anthony Bourdain’s No Reservations episode on Hokkaido. View of the Sumida River jutting out behind “Tembo Galleria,” the top deck of Tokyo Skytree. A mega-city merits a mega-sized section. 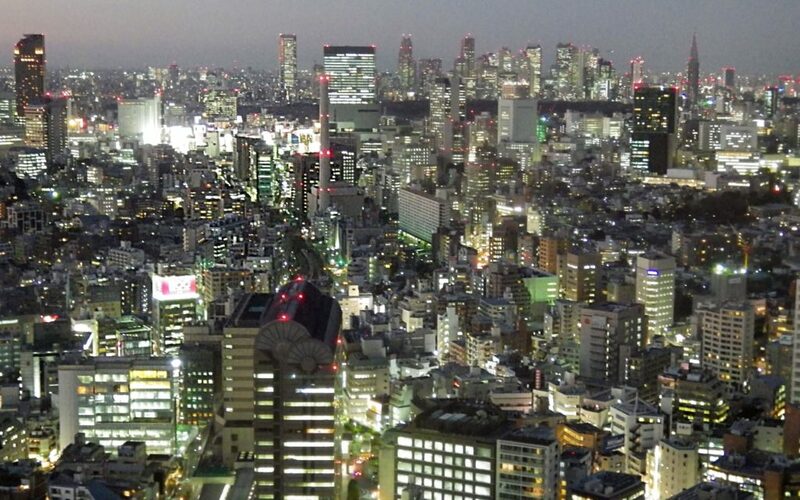 Tokyo is Japan’s sprawling capital and when measured as a metropolitan area (including its vast suburbs), it’s the world’s most populous metropolis. At times, the various wards and districts in this city feel like their own thriving, autonomous sub-cities. Everyone knows Tokyo Tower and Tokyo Skytree. The only downside to iconic observation decks like those is that they can be expensive. 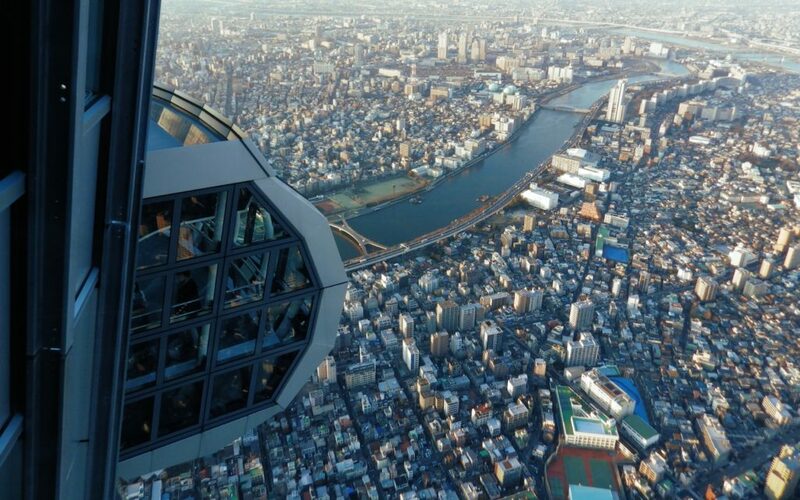 To get to the uppermost deck in the Skytree, you’ll need to fork over ¥3,090. Since undergoing renovation and reopening in 2018, Tokyo Tower’s top deck has undergone a significant price increase, too. To get to the top, it will now run you ¥2,800. The glittering city. A twilight view of Shinjuku and Shibuya from Ebisu Garden Place. The helicopter pad on the open-air sky deck of Mori Tower. I don’t know about you, but I’m a sucker for open-air sky decks, especially ones that have a helicopter pad on top of them. Mori Tower has one of those. Visitors to the Mori Art Museum and/or the tower’s indoor observation deck, Tokyo City View (¥1,800), can access the sky deck for an additional ¥500. Tokyo City View has the added perk of doubling as a sky gallery, with pop culture-themed events like the Ghibli Expo and the Marvel Age of Heroes exhibition having run in years past. 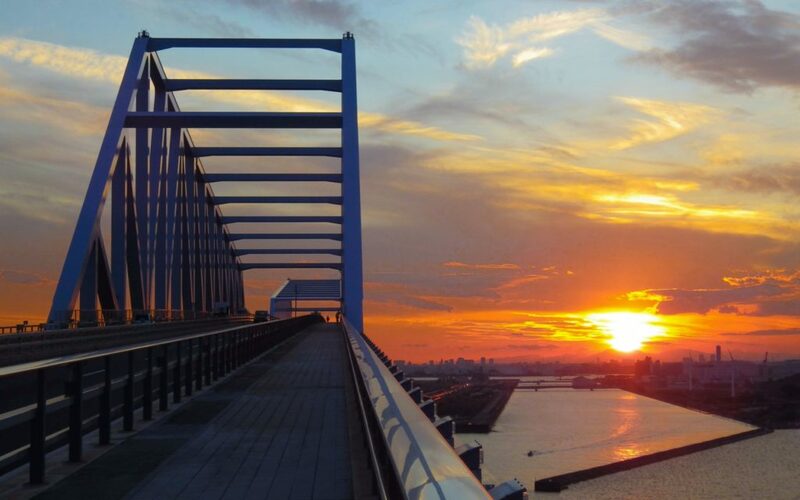 Watching the sun set behind the distant cityscape from Tokyo Gate Bridge. Two other paid observation decks in Tokyo are the Sunshine 60 “Sky Circus” (¥1,200) in Ikebukuro and the Tokyo World Trade Center (¥600, with a view of Tokyo Tower) in Hamamatsucho. You can walk across the Rainbow Bridge in Minato-ku and the Tokyo Gate Bridge in Koto-ku for free. 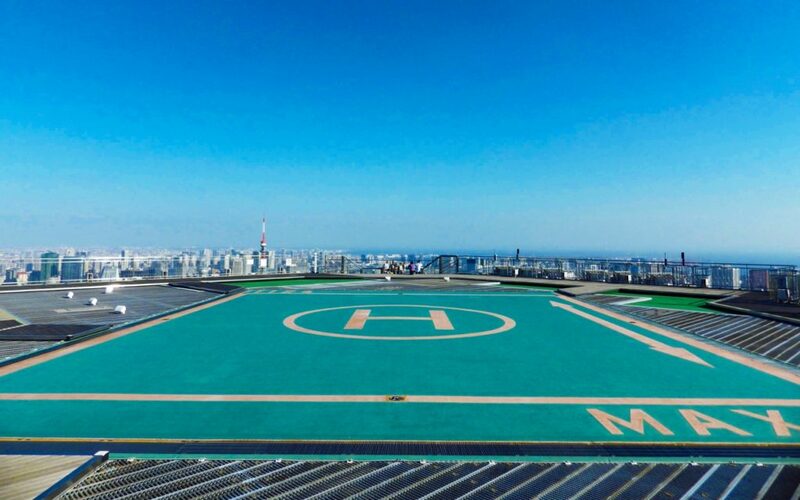 If the Mori Tower helicopter pad makes you want to actually ride a helicopter over the capital, you can catch a shuttle bus to Urayasu Heliport in Chiba from Maihama station (the stop for Tokyo Disneyland). Excel Air Service offers a 15-minute daytime or twilight sky cruise for ¥20,400. Shinjuku and the Cocoon Tower from Seiji Togo Memorial Sompo Japan Nipponkoa Museum of Art. Hotel views open up another can of worms, but a list like this wouldn’t be complete without at least a mention of the Park Hyatt Tokyo in Shinjuku. We’ve got a separate guide on where you can get a bird’s-eye view of its fellow Lost in Translation location, the Shibuya scramble crossing. Never mind its breathlessly long name, the Seiji Togo Memorial Sompo Japan Nipponkoa Museum of Art has a great view — in addition to having Vincent Van Gogh’s “Sunflowers” on permanent display. From the window in the lobby, you can see the Mode Gakuen Cocoon Tower up close, along with Kabukicho and other parts of Shinjuku. 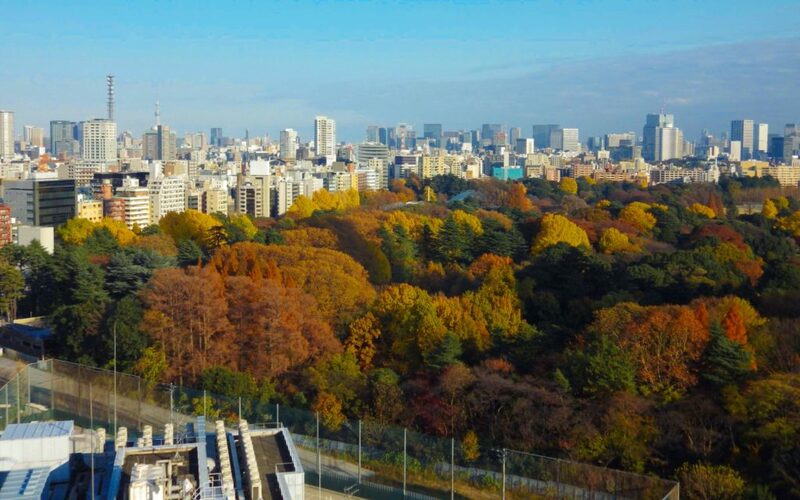 Fall colors in Shinjuku Gyoen, viewed from the 13th-floor terrace of Takashimaya Times Square. The award for “best bathroom view” goes to the restrooms on the 14th floor of Takashimaya Times Square in Shinjuku. There is also a 13th-floor terrace in this building with a view of Shinjuku Gyoen and the NTT Docomo clock tower. While you’re in Asakusa, don’t just gaze across the river at the golden, beer-glass-shaped building of Asahi Breweries headquarters in Sumida. 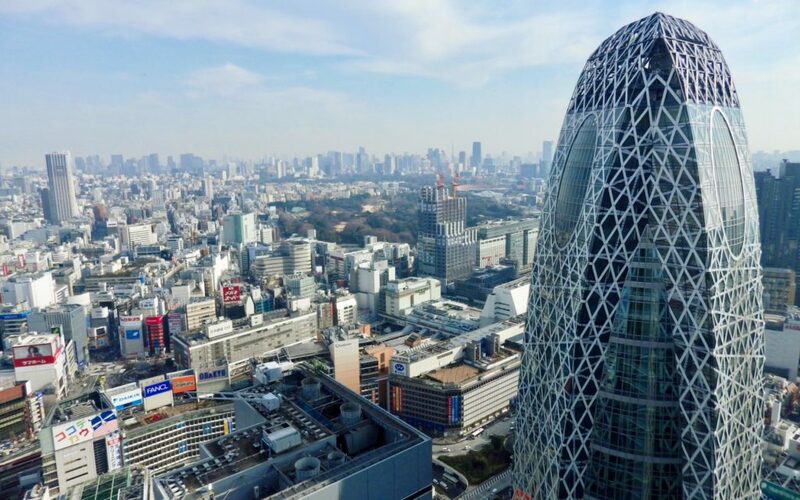 Go up to the 22nd floor — the level that comprises the “foam head” of the premises — grab a beer in the Asahi Sky Room and enjoy a view of Asakusa, the Sumida River and Tokyo Skytree. 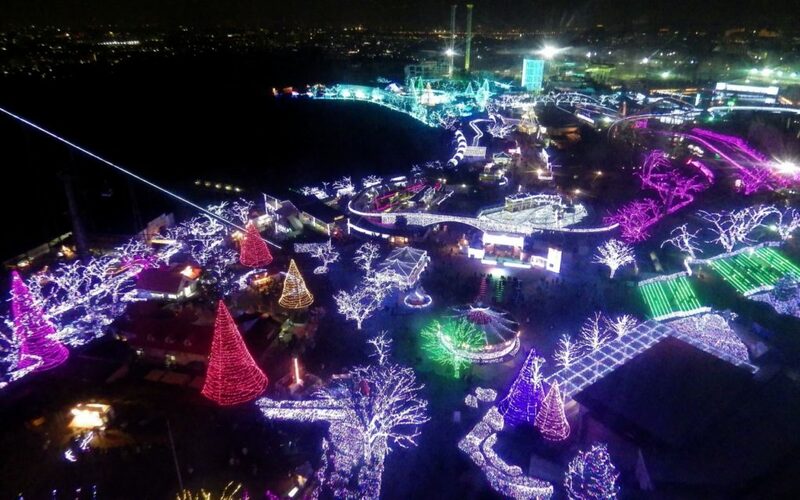 The Ferris wheel view of Yomiuriland's winter lights display, Jewellumination. Diamond and Flower Ferris Wheel (¥700, with a view of Kasai Rinkai Park and Tokyo Disney Resort) in Edogawa. Daikanransha (¥1,000, with a view Tokyo Bay) in Odaiba. Big O (¥820, a centerless, karaoke Ferris wheel with a roller coaster looping through it, and a view of Tokyo Dome City) in Bunkyo-ku. Yomiuriland Ferris wheel (¥600 with entrance-only park ticket, a beautiful night view of the park’s winter “Jewellumination”) in Inagi. Minato Mirai, glimpsed from the top of Yokohama Landmark Tower. Standing at almost 300 meters, Yokohama Landmark Tower currently ranks as Japan’s second-tallest building. Its elevators are some of the fastest in the world. In just under 40 seconds, they will whisk you from the lobby up to the sky garden on the 69th floor. The sky garden (¥1,000 entrance fee) boasts an expansive city view, with one side looking right down on the “port of the future,” Minato Mirai. Visible landmarks include the Cosmo Clock 21 Ferris wheel (¥800) and the Intercontinental Yokohama Grand hotel. The former is the world’s biggest digital clock while the latter is notable for its distinct white yacht-sail shape. You can also see the historic Yokohama Red Brick Warehouse. Past there, near Yokohama Chinatown, stands Yokohama Marine Tower, the tallest inland lighthouse in the world. 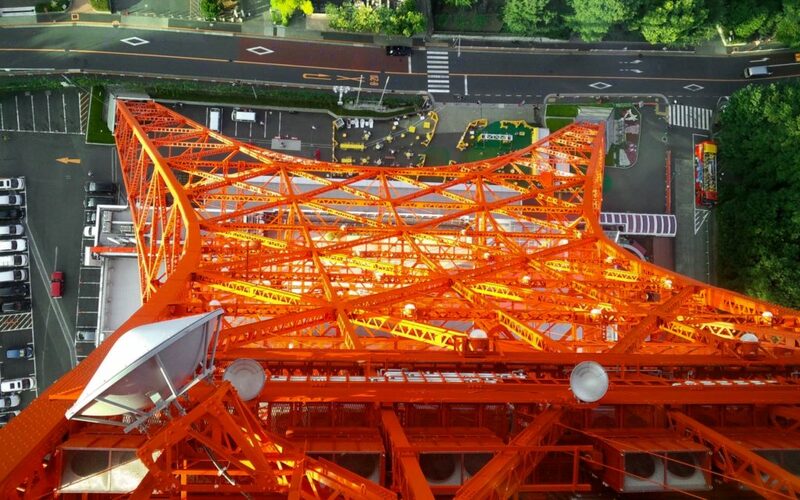 ¥750 will gain you entrance to the two-story observation deck, which occupies its 29th and 30th floors. 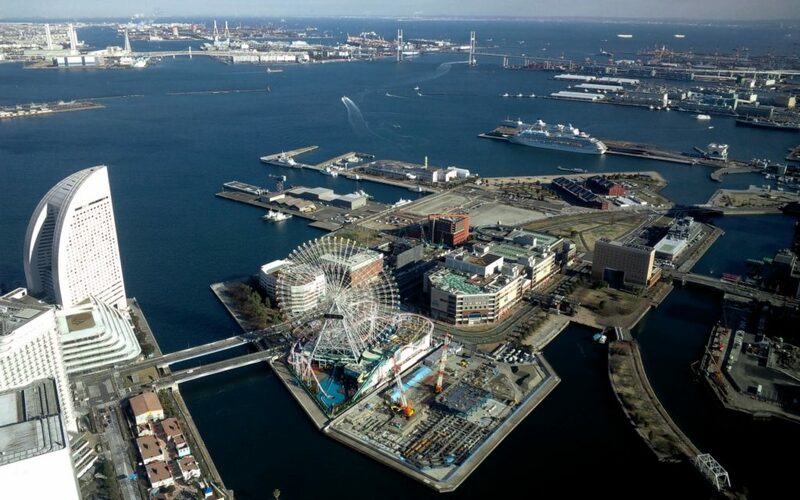 The line of towers along the harbor concludes with the free 360-degree panorama of Yokohama Port Symbol Tower at Honmoku Port. Perched on a hill overlooking Yokohama Bay Bridge is the open-air Harbor View Park, which is also free to access. Aerial view of Ginkakuji, the temple of the Silver Pavilion, a Zen temple founded in 1490 in the east of Kyoto. Temple and shrines are a defining trait of Kyoto. There are at least 2,000 of them spread out over the city. Japan’s ancient capital isn’t the kind of skyscraper town that is littered with observation decks. 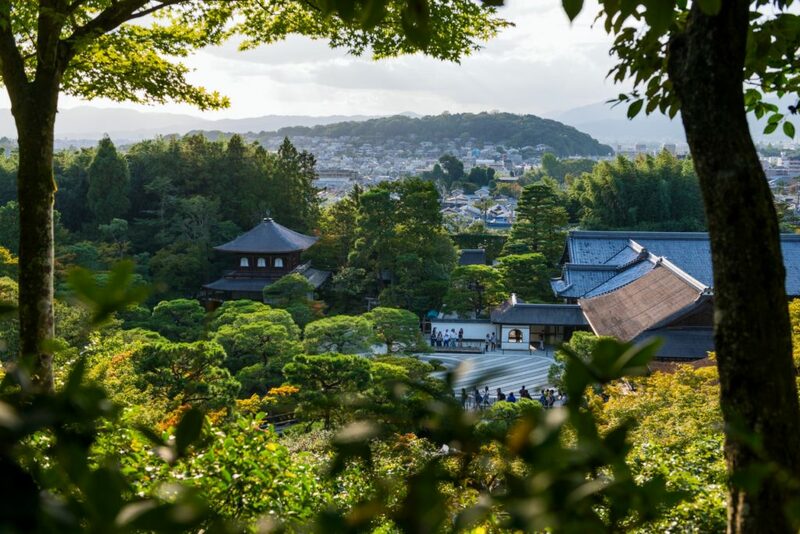 Yet some of Kyoto’s most famous temples and shrines do provide elevated views of the city. The main hall of Kiyomizudera Temple (¥400 admission) is currently covered up with scaffolding as it undergoes renovation until 2020. That notwithstanding, you can still behold the city skyline — including Kyoto Tower — from the temple grounds. Ginkakuji Temple (¥500 admission) also has a spot on the grounds where you can ascend a hill overlooking the temple and city. Fushimi Inari Shrine is free to access 24 hours a day. When you make it up through the tunnel of 10,000 torii (Shinto shrine archway) gates to the summit of Mt. Inari, you can do a victory bounce like Rocky Balboa and enjoy a panoramic view of Kyoto. Architect Hiroshi Hara designed the futuristic Kyoto station to have a “geographical concourse.” He intended people passing through it to feel like they were traveling down the side of a mountain into a valley basin. 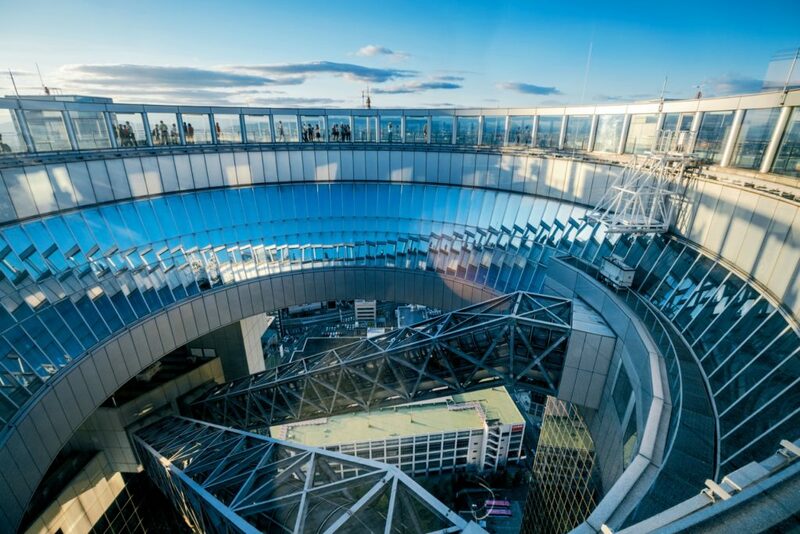 The valley is deep in Kyoto station, but if you ascend to the top of that metal-and-glass mountain, there’s a skywalk that provides an up-close view of Kyoto Tower with the city behind it. Staying at the Kyoto Tower Hotel will not only give you convenient access to the city buses bound for local landmarks from the station. It will also give you complimentary access to the Kyoto Tower observation deck (which otherwise runs ¥770). Umeda Sky Building rooftop in Osaka. Forget Tokyo versus Osaka: the real rivalry is between Osaka and Yokohama. These two cities wage a daily struggle over population, with the former’s being larger during the daytime. In 2013, Osaka’s Abenos Harukas opened, using its 4-meter height advantage to unseat Yokohama Landmark Tower as the tallest building in Japan. The Abenos Harukas observation deck will set you back ¥1,500. 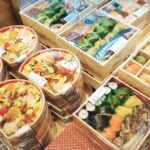 Across town, the lumbering architectural monstrosity that is the Umeda Sky Building charges the same price for admittance to its sweet open-air tenbo-dai. As you wind around the donut-hole center of the circular deck and enjoy its commanding river view, you can feel the wind whipping through your hair. Up here, your camera won’t have to deal with any pesky window glare. Shachi Gawara statue at the top of Osaka Castle in afternoon light. Forget the incongruous elevator outside Osaka Castle. Access to a 50-meter observation deck on the castle’s eighth floor is included with a ¥600 museum ticket. 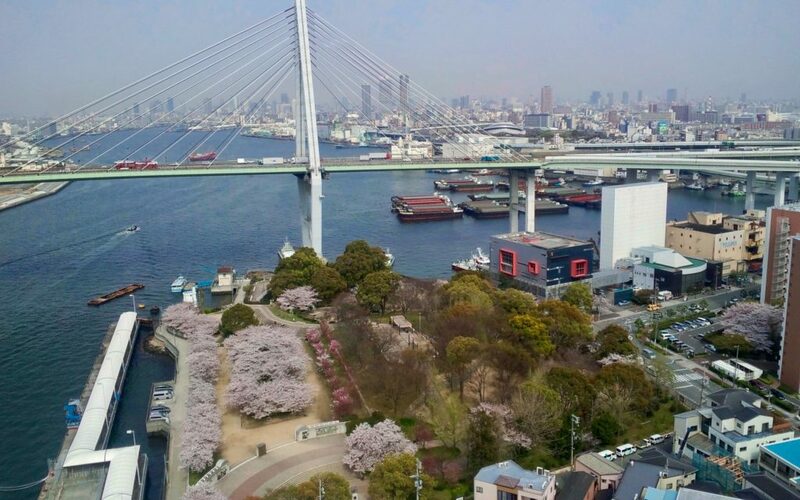 Overlooking the Shinsekai district, another famous symbol of Osaka is Tsutenkaku — whose name means, “Tower Reaching Heaven.” ¥700 gets you into the general observatories on the fourth and fifth floors of Tsutenkaku. 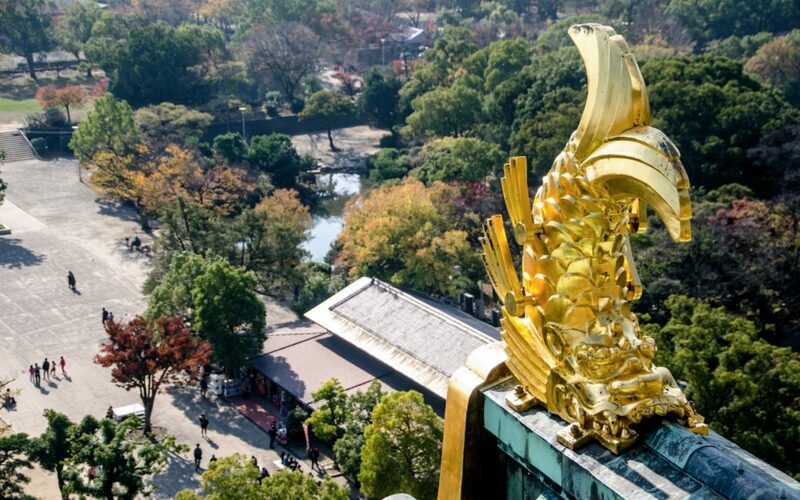 For an additional fee of ¥500, you can play in the open air again on the rooftop observation platform. Tempozan Ferris wheel view of Tempozan Bridge and cherry blossoms blooming in Tempozan Park. In 2018, after being closed for nearly a decade, Osaka’s Don Quijote Ferris Wheel (¥600) started operating again along Dotonbori Canal. This is just one of the city’s numerous Ferris wheels (kanran-sha in Japanese). There’s also the rooftop HEP Wheel (¥600) and the Rinku Town Ferris wheel (¥700). Expo City is the location of Japan’s largest kanran-sha, the Redhorse Osaka Wheel (¥1,000). However, its view of highways and parking lots is less scenic, perhaps, than the Tempozan Ferris Wheel (¥800). Tempozan’s wheel surveys Osaka Bay and landmarks like the Kaikuyan Aquarium and Akashi Kaikyo Bridge. Across the water, on Sakishima Island, an inverted pyramid tops Cosmo Tower, which serves as the seaside headquarters for Osaka’s prefectural government. At 52 stories, it’s currently Japan’s third tallest building. A ticket to its observatory fetches ¥700. In Kobe, the view from Mt. 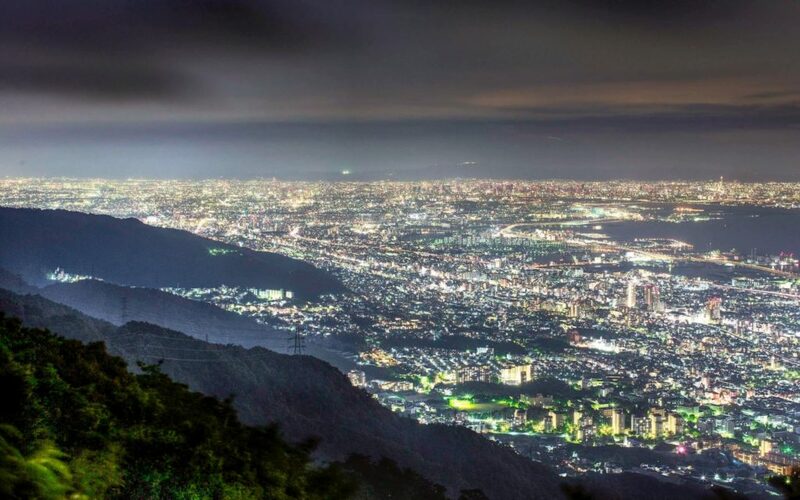 Maya is said to be one of the top three nighttime views in Japan. This mountain is part of a range, which has led to some confusion between its “10-million-dollar view” and that of the adjacent Mt. Rokko. A cable car (¥590 one-way) takes you to the first observatory on Mt. Rokko, while a bus gives access to a nearby garden terrace and second observatory. From there, you can take the Rokko-Arima Ropeway (¥1,010 one-way) up to Arima Onsen. Meanwhile, the Shin-Kobe Ropeway (¥1,500 round-trip), gives a closer view of the city skyline, as well as Nunobiki Waterfall. The suspensions cables of the Akashi Daikyo Bridge, slinking down toward the coastline of Kobe.. Shaped like a Japanese tsuzumi drum, the recognizable red beacon of Kobe Port Tower has five floors worth of lookout windows (¥700). In the surrounding Harborland district, the seaside shopping mall of Kobe Mosaic has its own tri-colored Ferris wheel (¥800). Kobe City Hall also has a free observation lobby. Stretching from Kobe to Awaji Island, the Akashi Kaikyo Bridge is the world’s longest suspension bridge. 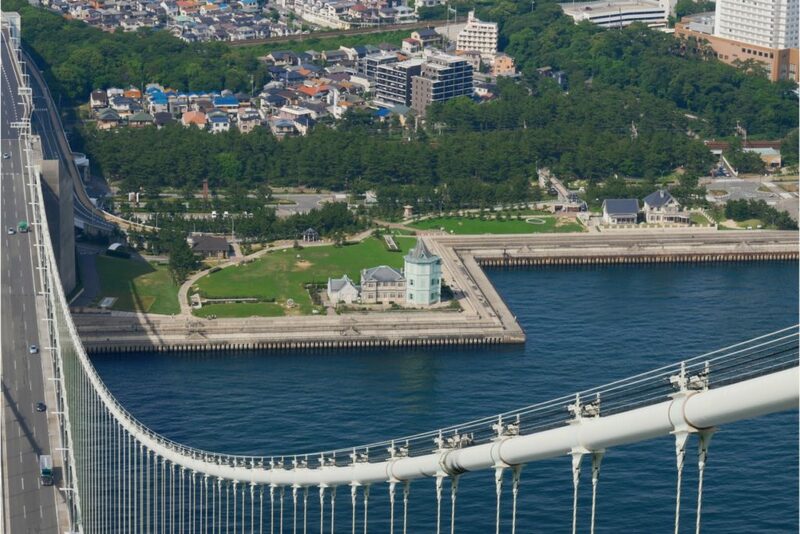 Alas, while you can’t walk all the way across the bridge, it does have a nominal “promenade.” The Marine Maiko Promenade gives a view of the framework under the bridge, the waters of the Akashi Strait and the Kobe coastline. The hilly sprawl of Nagasaki, seen from the Glover Sky Road. The view of Nagasaki city from Mt. Inasa is considered another one of Japan’s top three nighttime views. Within walking distance of the mountain ropeway (¥1,230 roundtrip) is Mirai Nagasaki Cocowalk, a shopping mall with a rooftop garden and a Ferris wheel that tops out at 70 meters (¥500). It’s not the main draw, but the hillside museum of mansions that is Glover Garden (¥610 admission) holds a panoramic view of Nagasaki port. The more interesting view, however, can be found over on the Glover Sky Road. This scenic outlook is adjacent to Glover Garden and can be accessed for free via an incline elevator. 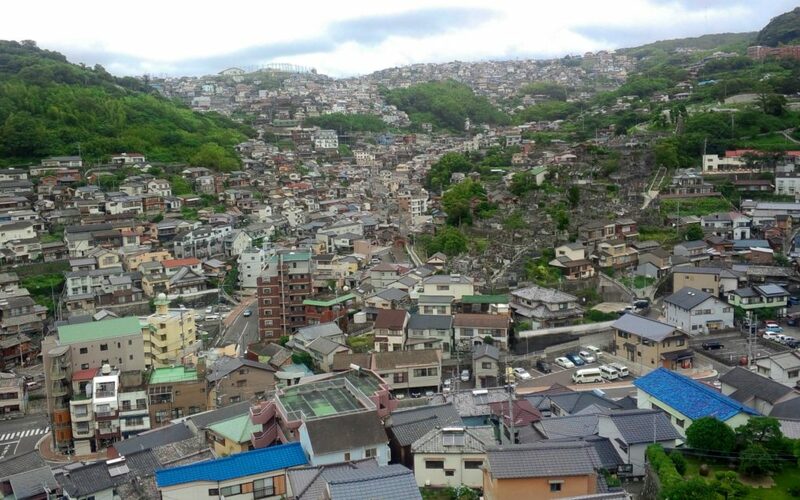 Nagasaki is surrounded on three sides by mountains and the Glover Sky Road will give you a view of the city’s buildings and homes spread out over rolling green hills. View from Dom Tower (known by its Dutch name, Domtoren) of the Huis Ten Bosch theme park. 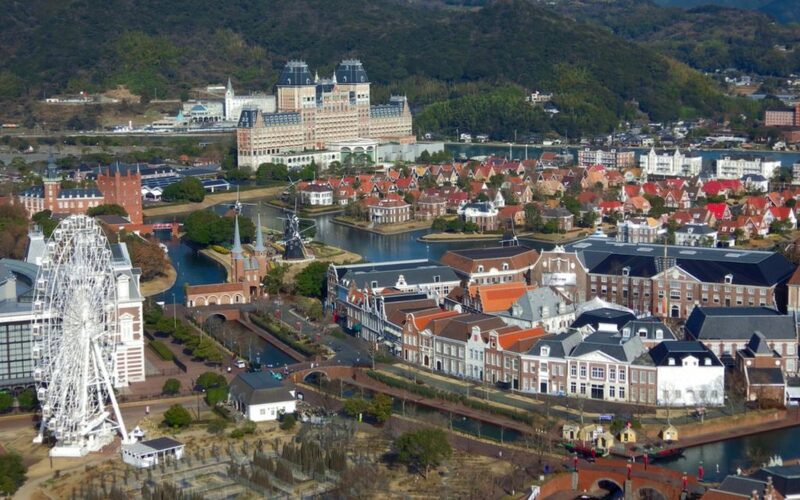 Elsewhere in Nagasaki Prefecture, there is the Dutch-themed amusement park Huis Ten Bosch. Located in Sasebo — a one-hour side trip from Nagasaki city — this park contains a faithful recreation of Dom Tower, the tallest church tower in the Netherlands. An 80-meter observation platform near the top of the tower offers a sweeping view of the whole park. Looking down on its windmills, Dutch-style buildings, and Amsterdam City section, you might forget for a moment that you’re in Japan and not the Netherlands. It’s just one of the unique aerial views characterizing cities all across the Land of the Rising Sun. Are there any notable spots we left out? Have you taken in an amazing view in one of these cities? What about other places in Japan? Reach down from the sky and comment below with your own essential lookout recommendations!